References to William the Conqueror, the D-Day landings and the Bayeux Tapestry are to be found throughout Normandy. The Bayeux Tapestry is a 70 metre long tapestry which depicts the events leading up to the Norman conquest of England, William I and Harold II, and culminating in the Battle of Hastings. The detail on the embroidery accompanied by the commentary, really do bring the story to life. You can visit the burial place of William the Conqueror (Duke of Normandy) at the Abbaye Aux Hommes in Caen. Falaise castle where he was born is also open to the public. Evidence of the D-Day landings which took place on 6 June 1944 and the subsequent events is one of the major reasons to visit Normandy. 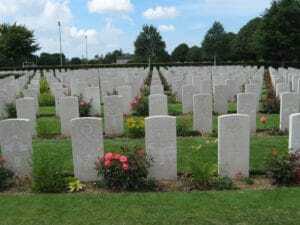 The beaches, museums and war cemeteries give an insight into the heroic sacrifices made, the destruction and the significance of liberating France.